It’s in a farmer’s field that what’s thought to be the largest Roman mosaic in Southern Turkey was found, when back in 2001, archaeologists took notice of marble fragments showing up on a freshly plowed field near the ancient city of Antiochia ad Cragum. 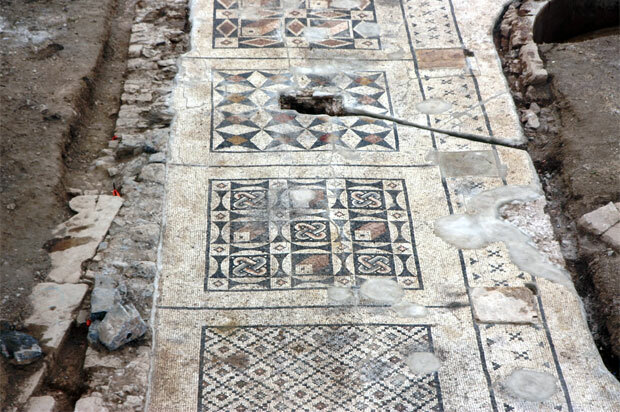 Today, museum archaeologists have unveiled about 40% of the mosaic, likelydating back to the third or fourth century. Measuring an astonishing 1,600 square feet of beautifully decorated tiles, the mosaic was once the floor decoration of a 7-meter long pool. Featuringlarge squares with unique geometric patterns, the giant mosaic reveals a purely Roman design, highlighting the historical and archaeological importance of an area that had been previously disregarded. The finding of a mosaic of such size and calibre in this part of the world suggests that Antiochia ad Cragum was far more influenced by the Romans than believed. 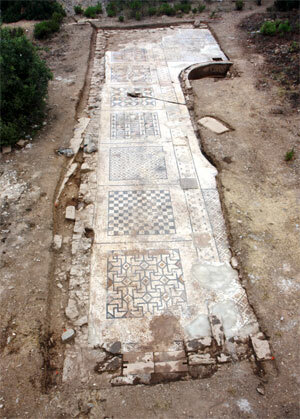 The mosaic excavations are expected to be completed in June 2013, with an ultimate plan to construct a wooden shelter over the entire mosaic and open the site to public visits.